A tree lighting is one of the most festive ways to get into the Holiday Spirit. Nothing quite says Christmas like snow, hot cocoa, singing Christmas carols and of course a holiday tree lighting. If you are hoping to gather some family and friends to see a tree lighting this year, we’ve put together a list of some of the most popular events happening in New Jersey and New York City. 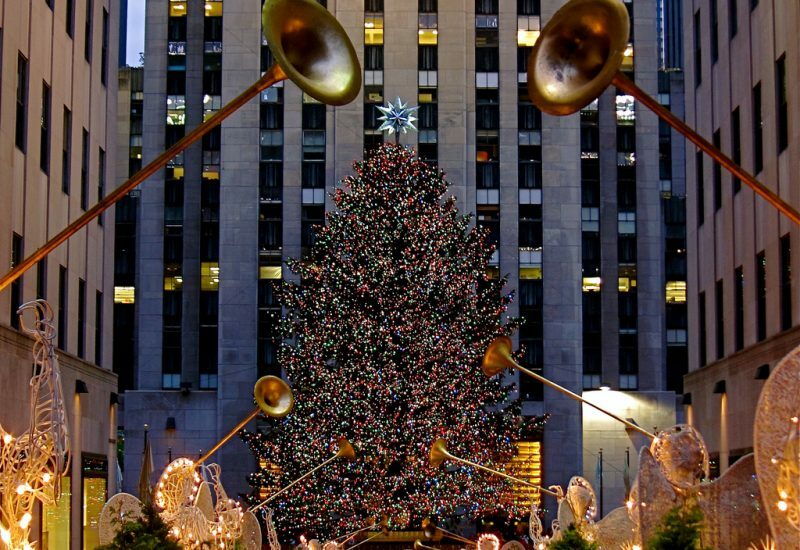 Whether you are planning to go to the Rockefeller Center Christmas Tree lighting or a local tree lighting, get in the holiday spirit in style and book a party bus or limo to drive your family or group. Not only is this a more relaxing option, but it will make your evening feel even more exciting! Contact Ambassador Limo and Party Bus at 1-800-979-9663 or send a message here. Here are 12 of some of the most festive Christmas tree lighting celebrations in New Jersey and New York City! Join Santa Claus and Dr. Physick on the Physick Estate for a special Christmas tree lighting. There will be refreshments served, and guests can enjoy a free self-guided tour of the Physick Estate. Kick-off the holiday season by visiting the Green at Palmer Square and watch as they light 32,000 lights atop our 65-foot-tall Norwegian Spruce Christmas tree! 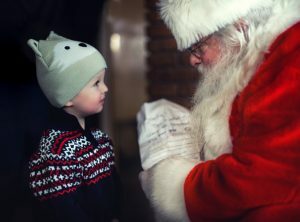 After you can take a walk around the town, listen to joyful musical performances and even see Santa! The Winter’s Eve at Lincoln Square holiday celebration features free entertainment, family fun, outdoor food tastings and much, much more. The event begins with the Upper West Side’s tree lighting ceremony located at Dante Park. Then the celebration continues in public spaces, in select indoor venues and along the sidewalks of Lincoln Square, the gateway to the Upper West Side, from Time Warner Center at Columbus Circle to 70th Street – in and around Broadway. It’s the perfect way to kick off the holiday season. Join Santa and his friends in Central Park to sing carols on the Plaza, and warm up with hot cocoa and cookies. The event also includes a festive lighting of a flotilla of trees on the Harlem Meer. The event is perfect for all ages. They will have horse-drawn carriage rides, holiday cookies, music, carolers and even Santa himself will be making an appearance! They also encourage everyone to bring a toy to donate to Toys for Tots. Join Santa and Mrs. Claus for a festive holiday tree lighting with free horse and buggy rides, hot chocolate, candy and music by the Henry Hudson acapella choir. Kick off the holiday season right by coming down to watch the lighting of the Community Christmas Tree! Enjoy hot chocolate, cookies, and caroling provided by the Girl Scouts, and even catch a glimpse of Santa as he is escorted by the Union Fire Company to visit the children! This is a spectacular holiday event featuring the stunning lighting of the official New York State Holiday Tree at the Empire State Plaza. Both the Taste of NY Holiday Market at New York State Museum and the Great Train Extravaganza take place the same day. This is full day of fun holiday-themed events is sure to get you in the holiday spirit and even better the night ends with a fireworks display! Visit NYBG for a special tree lighting in their Visitor Center where you’ll also be able to join in on an old-fashioned sing-along with a New York City based musical group. The Tree Lighting Skate-tacular features performances by Olympic skaters Johnny Weir, Kaetlyn Osmond, Megan Duhamel and Eric Radford, and Jeremy Abbott. The night is led by a celebrity narrator who reads an original Christmas tale. As the story unfolds, the characters are brought to life by world-class skaters on the ice leading up to the finale with tree lighting and fireworks. Join the Rob Susman Brass Quartet to sing joyful holiday songs as their beautiful holiday tree is lit. Santa Claus will also be joining the festivities to hand out candy canes to little ones. The Washington Square Association will also be providing visitors with songbooks. Head down to the Hudson River for their holiday tree lighting party. Join their festive celebration filled with live music, dancing, tree decoration making, and delicious hot chocolate! 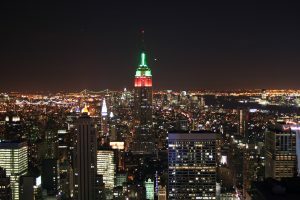 Of course, a list of holiday tree lightings wouldn’t be complete without the Rockefeller Center Christmas tree lighting. 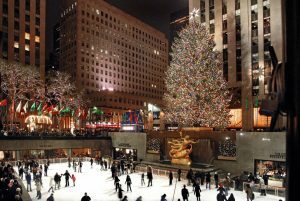 Probably, the most well-known and watched tree lighting in America, thousands gather live every year in Rockefeller Center Plaza to watch the tree be lit. The event is complete with live singers and entertainment and tons of Christmas cheer! Book your limo or party bus for New Year’s Eve in New York City today. For some more exciting NYE events in NYC click here.